As a society we have never had so much information at our fingertips about nutrition and fitness. Television programs, radio segments, newspaper and magazine articles, books, social media…no matter where you look it’s there. And yet, with all the available information, there has never been so much confusion about fitness & food. So many people are tired. Others are struggling with a bad case of the Winter sads (seasonal affective disorder). It is distressing that so many men and women are struggling with their weight. Exercising is seen by many as a chore not a priority and that it often takes a special event to find the motivation to lose those extra kilograms. I think life is a special event and with a few basic, free and ‘sustainable’ tips we can get that ball rolling. Spring has arrived, so it’s the perfect time to dedicate time to looking after YOU! Before embarking on any fitness program it is advisable to have a have a complete health overhaul. When was the last time you had your blood pressure, iron, thyroid & cholesterol (etc) levels tested? Celebrating ‘milestone’ birthdays often means that additional tests are available and can be bulk billed through Medicare. Don’t procrastinate, make an appointment (now) with your local GP! Get moving! The difference between a grape and a sultana is water. It might be cold but your organs still need to be hydrated. Grab a stainless steel (reusable/bpa free bottle) and fill it with tap water. Does your fridge & pantry need detoxing? Discard or compost produce that is past its best before date. If you eat processed food that has been made by people in white coats you’ll end up visiting doctors in white coats. Learn how to read food labels and perhaps grow your own produce (herbs are a great start). Seek out local food collectives or attended Farmers’ Markets. Re-stock your fridge & pantry with basic, real food (stuff that doesn’t come with excess numbers or packaging!). Invest for your body. Purchasing correctly fitted workout gear is essential. Shoes and bras are expensive but so are physio appointments. If you wear loose fitted garments you will feel fat & frumpy. I always make the suggestion to clients to wear gear that hugs. Your curves have taken years to earn…show them off and be proud of who you are. Love your body. There is nothing more deflating than unachievable training programs. You have heard the expression ‘quality not quantity’. If you are new to exercise it’s far better (physically and emotionally) to complete 10 minutes of focused exercise per day than doing nothing. Small achievable, sustainable steps. 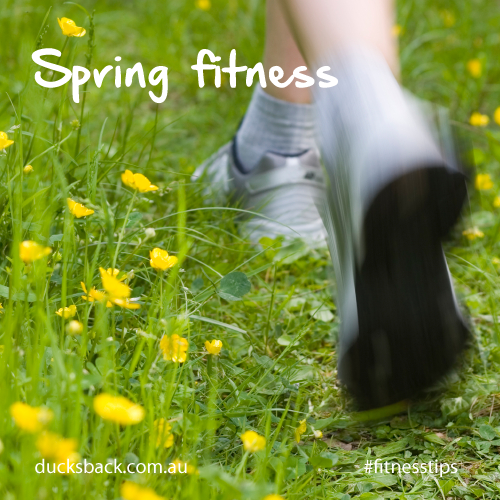 When your fitness improves you will naturally want to exercise for longer periods. The body thrives on those positive endorphins! Hop to it!